Jesus Christ suffered to the point of death for the sins of others. Jesus’s suffering had a redemptive purpose. Jesus Christ willingly suffered for the sake of sinners who were persecuting him and we are called to follow the same path. Like Noah, Peter’s readers live in a hostile world. Like Noah, they need to be saved from the coming judgment. Christ is the means of their salvation from judgment just as the Ark was the means of salvation for Noah and his family. Peter says the ark was a “type” of baptism. A shadow is a type of the person casting the shadow. It is an image of the real thing, like or corresponding to the real thing. A type is NOT a hidden symbol. It foreshadows a truth to come. 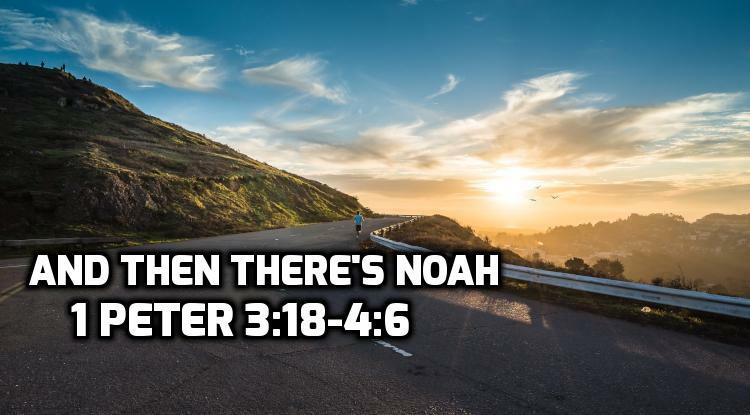 In general Peter’s main point is: God intends to save His people from the coming judgment like He did for Noah. But the means of salvation is not an ark, it is the suffering of Christ. And the salvation secured is not rescue from drowning, it is the forgiveness of our sins. The one who has “ceased from sin” has stopped pursuing a sinful lifestyle. The more we become like Christ, the more the world grows hostile toward us and suffering will result. The problems in this text center around 4 main questions. The chart gives the main interpretative options, although there are many nuances and variations on these answers. I have simplified and condensed the interpretative options into their main categories. Granted, I may be guilty of oversimplifying. Putting these options together, here are the 3 most popular views. You are more likely to find options 1A & 1B in older commentaries. You are more likely to find option 2 in modern commentaries. You are more likely to find option 3 in modern commentaries. This is the option I lean toward at this time because I think it best fits the context. Give more weight to clear passages of Scripture. Avoid building doctrine on a single verse or a single passage. Context is always the determining factor. The more confusing or obscure the passage, the more we ought to hold our conclusions lightly. Previous: 07 1 Peter 3:8-17 Who is there to harm you?